The meteor that exploded over Russia Friday was slightly larger than previously thought and more powerful, too, NASA scientists say. The Russian meteor explosion over the city of Chelyabinsk, on Friday (Feb. 15), injured more than 1,000 people and blew out windows across the region in a massive blast captured on cameras by frightened witnesses. Friday afternoon, NASA scientists estimated the meteor was space rock about 50 feet (15 meters) and sparked a blast equivalent of a 300-kiloton explosion. The energy estimate was later increased to 470 kilotons. The meteor was also substantially more massive than thought as well. Initial estimated pegged the space rock's mass at about 7,000 tons. Scientists at NASA's Jet Propulsion Laboratory in Pasadena, Calif., now say the meteor weighed about 10,000 tons and was travelling 40,000 mph (64,373 km/h) when it exploded. "These new estimates were generated using new data that had been collected by five additional infrasound stations located around the world - the first recording of the event being in Alaska, over 6,500 kilometers away from Chelyabinsk," JPL officials explained in the statement. The infrasound stations detect low-frequency sound waves that accompany exploding meteors, known as bolides. What appears to be a meteor trail over eastern Russian is seen in this image released Feb. 15, 2013, by the Russian Emergency Ministry. The meteor fall included a massive blast, according to Russian reports. 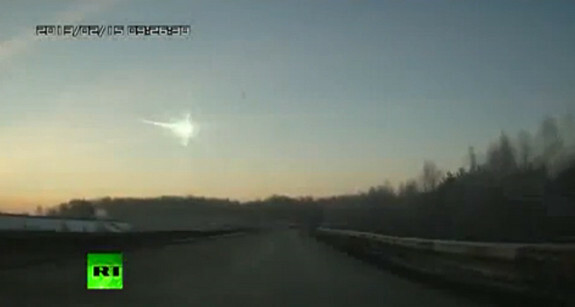 The meteor entered Earth's atmosphere and blew apart over Chelyabinsk at 10:20 p.m. EST on Feb. 14 (03:20:26 GMT on Feb. 15). The meteor briefly outshined the sun during the event, which occurred just hours before a larger space rock — the 150-foot-wide (45 meters) asteroid 2012 DA14 — zoomed by Earth in an extremely close flyby. Asteroid 2012 DA14 approached within 17,200 miles (27,000 kilometers) of Earth Friday, but never posed an impact threat to the planet. The asteroid flyby and Russian meteor explosion had significantly different trajectories, showing that they were completely unrelated events, NASA officials said. Late Friday, another fireball was spotted over the San Francisco Bay Area in California. That event, also unrelated, occurred at about 7:45 p.m. PST (10:45 p.m. EST/0345 Feb. 16 GMT) and lit up the nighttime sky. Aside from the unexpected light show, the fireball over San Francisco had little other effect. 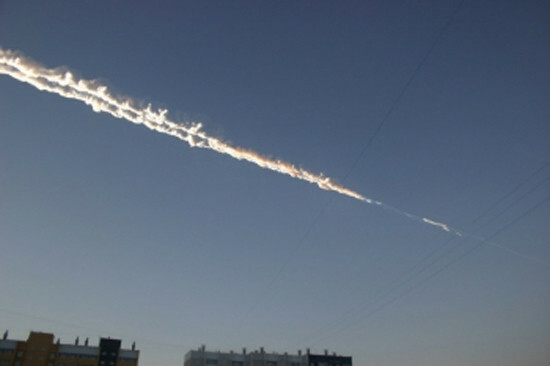 NASA scientists said the Russian meteor event, however, is a rare occurrence. Not since 1908, when a space rock exploded over Russia's Tunguska River in Siberia and flattened 825 square miles (2,137 square km) of uninhabited forest land, has a meteor event been so devastating. "We would expect an event of this magnitude to occur once every 100 years on average," Paul Chodas of NASA's Near-Earth Object Program Office at JPL said. "When you have a fireball of this size we would expect a large number of meteorites to reach the surface and in this case there were probably some large ones." According to the Associated Press, search teams have recovered small objects that might be meteorite fragments and divers are searching the bottom of a lake where a meteorite is thought to have landed.